Home » Apple » Goodbye Steve Jobs. This is the first of our week long special posts about Steve Jobs. Steve Jobs is the co-founder of Apple. Without him, technically there would be no computers today. If there are no computers, then there wouldn’t be an internet or a world wide web. Without the internet there wouldn’t be any blogs. Finally without computers, without the internet, without blogs, and without Apple, our site wouldn’t even be existing. So, along with the other Apple fans, our condolences and prayers goes out to Apple and the Jobs family. Steve Jobs died on Wednesday. he was just 56 years old. He could’ve shared to the world even more, but we’ve got to hand it to the guy, he fought until the end. He fought with a rare case of pancreatic cancer which wasn’t a secret to all, but even with cancer he still continued to serve Apple, until just recently. With which he gave his place to his co-founder, Tim Cook. When Steve Jobs died, it was like the whole world died with him as well. 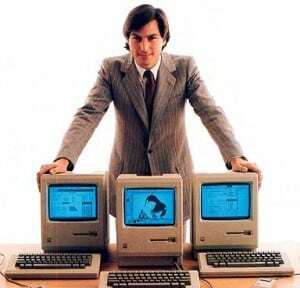 Tears were shed at almost every country that Steve touched with his technology and creativity. He is truly one of the greatest minds of our time. Steve is a champion and idol of many people. His life has inspired and touched countless of people especially the youth. His life served as an obvious testimony that you should never give up even to life’s challenges. Steve’s life was challenging, there’s no doubt in that. He was adopted, and he didn’t finish college – but that didn’t stop him from pursuing his dream. That didn’t stop him from inventing the Macintosh. That didn’t stop him from building Apple. That didn’t stop him from toppling down Exxon Mobile from its throne as the biggest technological company in America, and of course, the world. It wasn’t easy, and even until the last years of his life, he was haunted by negative experiences. Again, Steve just never gave up. He did everything he could to prolong his life. He did everything he could to fight out the cancer that was in him. This physical battle is aside from the battles he was handling as the chief executive officer of Apple. Some of the biggest battles of Apple has been with the world. There are environmental concerns. There are social problems being answered. Of course, we could not take aside the battles with other giant companies – like Samsung and Motorola – with which he fought for the sole ownership of his creative innovations. These battles have not ended yet, and we could only hope for its victory that relied on Tim Cook’s hands. Remembering Steve Jobs as this tough and creative role model, one is pushed to wonder, what would the world be without Steve? What will happen to Apple? Are the innovations of Apple going to stop? Most especially, what would the world become if Steve didn’t die? What more creations would he be able to share with us? Of course, these questions are not going to be answered anymore, and Steve wherever you are, I know you’ll always be watching out. Rest in peace.